My first purchase of 2018. I went on New Years Day and see what I could find at my Local toy store. Sweet find, I found Nickelodeon Usagi Yojimbo. I was looking for Usagi Yojimbo for awhile. This Figure looks looks really cool, can't wait to open him soon. I kind of hope Nickelodeon will make more Usagi comic action figures too. Just have to wait and see. The Ninja Turtles time travel through yet another portal and land in ancient Japan. Once they break free from the spell of the evil villain Jei, they team up with the great Rabbit Samurai Warrior, Miyamoto "Usagi" Yojimbo. 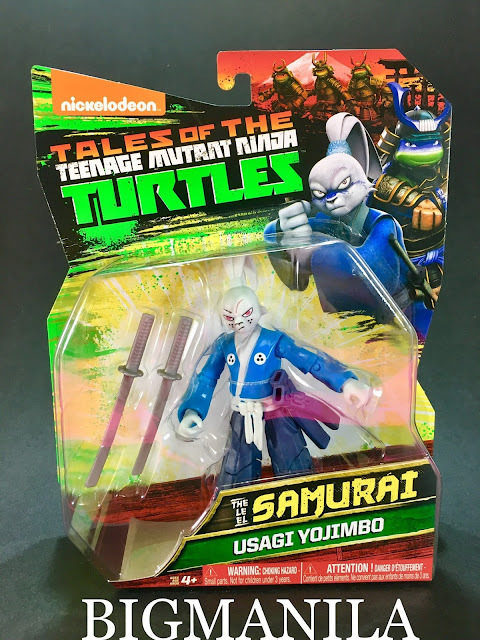 Together, the Turtles and Usagi travel through villain filled magical forests and icy mountains to defeat the evil Jei and any other enemy that threatens them. This line is now cancelled and the line they showed at toy fair looks horrible unfortunately. Really? They started to appear in toy stores where I'm from. Im was really excited for Usagi. The others I didn't really care for.